In her book the Unicorn Virginia Moore says: "To me all things are made of the conflict of two states of consciousness, being or persons which die each other's life, live each other's death, that is true of life and death themselves." She also says: "The acts and nature of spirit during anyone life are a section or abstraction of reality and are unhappy because incomplete. They are gyres or part of a gyre where as reality is a sphere." Another critical view on classifying poetry, in the book 'First Principle' written in 1904, states: "Art, in its highest moments, is not a deliberate creation, but the creation of intense feeling." In addition, Arthur Symons says: "The error of late periods like this is to believe that some things are inherently poetical, and pull them on to scene at every moment. It is just these seeming inherent poetical things that wear out." There is no one track view in poetry. Regardless of the fact that critics classify poetry, there are only two classifications: good and bad. Yeats represents a case standing on its own. He wrote in the 20th century. He is modern but not a modernist; he is not a symbolist or imagist. Yeats is coming from a wide extensive background of poetry, and he represents a track for which there was no taste. He did not create the taste upon which he could be followed or judged. Yeats is appreciated and to understand his poetry, one has to exert an effort. So, he has his own philosophy and every poet is a philosopher and thinker, but he has to leave his philosophy outside his poetry. When you start writing, you are a poet. Therefore, Yeats is a very particular poet, a particular character as a poet indeed. The requirements of poetry are very different, could Yeats fulfill these requirements being a particular poet? If we speak of rhythm in good poetry, it is not enough to observe rhythm because anyone could write poetry with rhythm and not be a good poet. The criterion in good poetry is that the reader should be patterned by the music of the words. If the poet achieves this, then he would be a good poet. In reading a good poem you would be oriented, however being sustained by a bad poet you cannot be patterned by his rhythm. Pattern is a product of the movement of a verse. Music is an achievement in language. Yeats is complicated and in order to clear this complication you have to look into his philosophy and his particular thought. He invents words and concepts which are his own, so we have to have a particular knowledge in order to study him (Ex: Perne in gyre). Yeats says in a letter to a friend: I have no speech, I have symbols. Most of his symbolism is subjective symbolism because elsewhere symbolism to a great extent has to do with the objectivity. A symbol in Yeats' poetry is subjective. 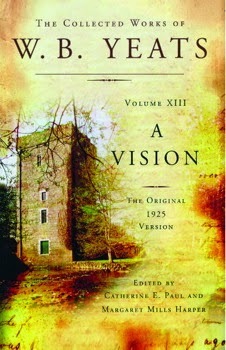 In his book "A Vision" there is terminology which we do not know, he invents words that stand for conceptions. He presents new terminology and conception. For example, a gyre would be a chain of circles, like a spiral spring. If we look down at them from above, we would see one circle. The circle represents the moon. In this book there is two moons and has twenty eight phases standing for the inexorable cyclic movement of history that determines all that happens. Each phase represents a period in history, and it is dominated by a certain civilization and its own myths. Therefore, each phase stands for one complete civilization (rise and fall of it). To these phases there is a beginning and an end. The end is a new beginning and not an end. There is the new moon represents the beginning of phases and the full moon represents the end of phases. For example, according to Yeats, the present cycle of history has started with birth of Jesus Christ and it will last till the year 2000. This explain his conception of duality. His world is build on a dual conception (something and its opposite) this is the world of Yeats on which he built his poetry. Unless one has passed through the two phases he would not have lived his complete life. Death is another life it is not an enemy. The cycle is made of 2000 years. Death is not the end. By necessity, one's life is unhappy because it is incomplete. His philosophy is not standardized. The polarities of his poetry are subjectivity and objectivity. His attitude towards poetry should affect the structural level of his poetry. Yeats was for a pattern in world and in poetry, he was against the free verse medium where there is neither a pattern nor structural rhythm. Therefore, Yeats had fulfilled one condition which is he is a philosopher, there is philosophy in his poetry and this is an obstacle to the reader. He created poetry, but he didn't create the taste. What comes with this philosophical movement, leads to another philosophical notion: The repeating notion of life and death moving in a parallel line with the cyclic movement. History moves in phases and cycles following the full moon and the moon. The axis of his poetry is set on this conception of duality and coexistence: existence of life, there is death; existence of body, there is spirit. Others have found a still point. However, the basic structure of his poetry is build on a dual structure of two opposites "death" and "life".